Yes! It’s the season that that the flowers rise! Finally, a splash of colour to join those evergreens we’ve been seeing all winter. Everyone has got to be excited about stepping out into a rainbow of deep orange tulips, ruby red roses and bright yellow daffodils. And the scent of all these budding beauties…ahhhh… the breath of fresh air we’ve all been longing for! The main reason why we all look forward to Easter! Easter chocolate is just mouthwatering, especially mini eggs! These little treats should be available all year round, but seeing as though they’re not it’s just another factor that makes Spring all the more special. I know we’ve already established flowers as being a definite Spring plus, but cherry blossoms are too pretty to not get their own spring recognition. First it’s a bare bracnched tree, then you see these tiny red buds and all of a sudden the next day you have a tree growing pink candy floss! And they don’t leave without a grand exit either. The world is sprinkled with the most delicate confetti, definitely a nice change! Pastel, floral print, lighter and brighter…all those clothes that have been shoved right to the back of your wardrobe waiting for the weather to accept them can be brought right back now! Mint, peach, pale pink, baby blue…yes, I’m talking about all those cute dresses we’ve all got hidden somewhere. Everybody loves dressing up, right? And Spring is the perfect month to enjoy every part of that. Flowery accessories, white jeans, net shawls…here I come! You can definitely look forward to feeling more vibrant in the morning as you wake up to the sound of nature. It will make the dreaded part of getting out of bed in the morning a lot easier, especially when you know you can push the windows open and be greeted by the sweet song of birds rather than an icy wind. 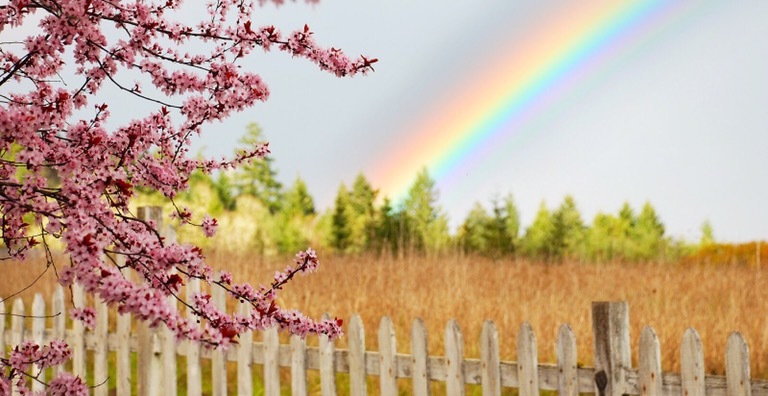 With those spring showers that leave glistening dew drops on the grass, and that gentle spring sun you’re sure to catch a rare spectacle of a rainbow at some point. In Winter it’s too dark, Autumn too rainy and in Summer there’s too much sun making Spring the prime rainbow season! It’s great to know we probably have a couple of these picturesque moments awaiting us in the near future! Longer days, more sun, more productivity! Yay! Spring is a busy season, there’s no doubt about it. A lot of us will be preparing for final exams or have lots of other work to do, and now you’ll have plenty of hours to do that! And the great thing is, longer days means you’ll be able to spare some time to relax as well…I just can’t wait for the clocks to change again! Those cold days are getting further and further away from us, so we might as well say goodbye to Mr Sniffles now. That radiant spring warmth is approaching us fast and the great thing is that Spring is practically the perfect temperature, not too hot, not too cold…we can finally just be without having to constantly adjust the heating. Come on, we can all admit we’ve been stuffed indoors trying to stay warm the whole Winter! Well Spring says there’s no time for that anymore! We can finally get that little bit of exercise we all need back, whether it’s walking down to the shop, or going for a leisurely cycle…it’ll definitely do us some good to see the great outdoors again! And all that extra energy you’ll get from these activities will be a great help in keeping you focussed this season! Spring is a new chance to start all over. Yes, all those new year’s resolutions and plans you made that you don’t want to admit went down the drain… here’s a fresh new chance for you to achieve them. In the middle of Winter none of us are really geared up to get right into action, but Spring truly marks the beginning of the new year and is the time for us to grasp every opportunity to do everything we’ve always wanted! I love all the spring flowers and stuff. Thank you for the post! Hope to see your dream comes true! It’s still raining! Hope that my thirsty soil is soaked up and give me plenty of spring flowers! Thank you for the lovely photos! You’re right, spring is so beautiful! And these 10 reasons to create a spring mood. Thank you for your comment! It’s lovely to hear that this post has helped you… ☺️ Hope you have a wonderful and uplifting Spring season!